Peptide-based therapies are showing increasing potential for the development of vaccines and in the treatment of many important diseases. We previously reported two peptide conjugate vaccines that protected mice against pneumococcal disease. During this study, we observed an unexpected phenomenon; several vaccine candidates induced a rapid, fatal anaphylaxis after booster injection of the peptide conjugate. Further investigation indicated the reaction was mediated by the production of peptide-specific IgE and the release of histamine. Notably, among seven peptides tested, all of which bound the same mAb that selected them from a phage library, only four elicited this severe reaction. Sequence alignment analysis of all peptides revealed unique clusters of acidic amino acid residues in the allergenic peptides. Substitution of the acidic amino acid residues, ED, of peptide MP2 with their amine equivalents, QN, eliminated the anaphylactic effects but did not affect the production of peptide-specific IgG. These results have important implications for both the study of allergens and the development of future peptide-based therapies. Peptide therapies are showing increasing potential in the treatment of many important diseases ranging from influenza to allergic disease and, more recently, cancer (1, 2). The activity of these short peptides varies significantly from interfering with native protein activity to inducing protection against larger vaccine targets. A successful new approach to circumvent the problem of using poorly immunogenic bacterial polysaccharides as effective vaccine targets is to substitute the native polysaccharide Ag with peptides that mimic the protective epitope (3–7). We have recently described the ability of peptide mimics of pneumococcal polysaccharides to induce immunity and protect mice against Streptococcus pneumoniae (8). In this study, seven peptides were selected from a phage-display library using the anti-type 6B polysaccharide mAb Db3G9. Surprisingly, immunization with four of seven 12-mer peptides induced symptoms of anaphylaxis in mice upon re-exposure to the Ag. This effect has not been described previously, and the results presented in this work could have important implications for both the study of allergens and the development of future peptide-based therapies. The peptides used in this study were selected from a random 12-aa phage-displayed peptide library using a human anti-6B pneumococcal polysaccharide mAb (Db3G9) as described by Smith et al. (8). Peptides of seven positive phage clones (MP2, MP10, MP13, MP14, MP15, MP17, and MP18, the sequences of which are shown in Table I) and the modified peptide MP2m were synthesized by standard F-moc solid phase peptide synthesis, and the peptide was conjugated to keyhole limpet hemocyanin (KLH) or BSA (at a molar ratio of ∼600:1) by Cambridge Research Biochemicals (Cambridge, U.K.). The purity of the peptides was >80% as assessed by HPLC. The molecular mass of purified peptides was confirmed by mass spectrometry. Each peptide conjugate was dissolved in PBS at a concentration of 5 mg/ml and stored at –20°C until use. Nine-week-old, outbred, female MF1 mice were purchased from HarlanOlac (Bicester, U.K.). The immunization of the mice was performed as follows: a stock solution of the native peptide, peptide–KLH conjugate, or serotype 6B pneumococcal polysaccharide (American Type Culture Collection) was diluted with PBS at a concentration of 0.5 mg/ml and emulsified with 0.5 volume of ImjectAlum adjuvant (Pierce, Rockford, IL). A control suspension containing 0.5 mg/ml KLH was prepared in the same way. The presence of endotoxins in the immunization solutions was excluded by means of a limulus amebocyte lysate test (Lonza, Slough, U.K.), which was negative (data not shown). Groups of 5–10 mice were sensitized by means of i.p. injection with 100 μl immunization solution. Sham-sensitized mice received KLH alone in PBS and adjuvant according to the same schedule. Three weeks after the initial injection, mice were challenged i.p. with a second dose of Ag as before. The health status of animals was monitored and their condition scored according to the scheme of Morton and Griffiths (9). The health status and body temperature of all mice was recorded before and immediately after challenge for up to 2 h. Body temperature readings were performed using a 1319 K-type rectal thermometer (TES, Taipei, Taiwan) and recorded once the digital display displayed a value for more than 10 s. Anaphylactic signs were evaluated for up to 1 h after the second challenge dose. Mice were culled if significant morbidity was observed. Cardiac puncture under terminal anesthesia was performed to recover blood from mice that had reached the end stage of the experiment or at the equivalent time point from mice from the control group that did not develop disease signs. To assess whether the peptides represent T cell epitopes, lymphocytes from two mice sensitized with MP2–KLH were obtained from homogenized spleens using standard techniques. Single-cell suspensions were labeled with 10 μM CFSE (Molecular Probes, Eugene, OR) and incubated for 10 min at 370C. After 10 min, the labeling was halted by centrifugation and resuspension in RPMI 1640 containing 10% HI-FCS, 2 mM l-glutamine, and 0.1 mM 2-mercaptoethanol. Cells were cultured in round-bottom 96-well plates (Corning Costar) at a density of 1.25 × 105 in the media above containing either 1:10 control solution (PBS), 10 μg/ml anti-mouse CD3 (plate-bound) with 2 μg/ml anti-mouse CD28 and 20 ng/ml IL-2, or 50 μg/ml MP2–KLH for up to 72 h. Proliferation was determined by FACS as previously described (10). To monitor serum IgE and IgG Ab responses, tail vein blood was obtained on days 0, 14, 36, and 56 after initial sensitization. Sera were prepared and stored at –80°C. Levels of peptide-specific IgE and IgG were measured by using ELISA. To separate the IgE fraction of the serum from the IgG, the sample was first passed through a protein G column. The elimination of the IgG fraction from the IgE preparation was confirmed using ELISA. Microtiter plates (Maxisorp; Nunc, Roskilde, Denmark) were coated with 5 μg/ml peptide–BSA conjugate in coating buffer, pH 9.6 (50 nM NaHCO3 pH 9.6, 0.02% [w/v] NaN3), 100 μl per well overnight at 4°C. The next day, plates were blocked with blocking buffer (5% [w/v] nonfat dry milk, 0.05% [v/v] Tween 20 in PBS) for 1 h at 37°C and washed three times with washing buffer (50 mM Tris HCl pH 7.5, 150 mM NaCl, 0.05% [v/v] Tween 20). Mouse sera were diluted 1:100 in blocking buffer and 100 μl added to the wells and incubated for 2 h at 37°C with shaking. The plates were washed three times as before, and binding Abs were detected using alkaline phosphatase-conjugated goat anti-mouse IgE or IgG secondary Ab (Fc specific; Sigma), diluted 1:5000, and 1 mg/ml p-nitrophenyl phosphate (N9389; Sigma) dissolved in 1 M diethanolamine pH 9.8 and 0.5 M MgCl2. Absorbance was read at 405 nm after 1 h at 37°C, and titer was determined as the dilution factor required to obtain greater than double the background absorbance. All analyses were performed in triplicate. Whole-blood samples were collected by cardiac puncture at the end of the experiment and were analyzed for histamine content using a radioenzymic assay as described by Sanmugalingam et al. (11). Cleared serum was obtained by centrifugation of clotted blood for 10 min at 8000 × g.
Survival data of mice immunized with the peptide–KLH conjugates and those that received KLH alone were analyzed by the Kaplan–Meier test using GraphPad Prism 5 software. Condition scores were used in place of survival data for groups V1–V6 as control mice were culled alongside experimental groups to obtain matched control serum for use in further tests. A Student t test was used for group analyses of IgG and IgE concentrations, condition scores, body temperature, and histamine concentrations. Significant statistical differences were noted as p < 0.05. Mice that received a booster dose of MP2, MP14, MP17, and MP18 peptide–KLH conjugates developed signs of anaphylaxis and experienced a high mortality rate (Fig. 1A). In contrast, all mice in the control (KLH) group and the groups that received the other three peptide–KLH conjugates (MP10, MP13, and MP15) survived. When anaphylaxis developed, signs were seen within 10 min of administering a second dose, and mice became severely lethargic. Cardiovascular collapse occurred after 15 min as seen by increased difficulty obtaining a tail-bleed. Signs of abdominal pain were noted with the mice lying down with their legs splayed and sides contracted. By 22 min, disease signs had developed to a severe status, and mice were culled. Peptide vaccines eliciting an immediate systemic reaction. One hundred microliters of the indicated peptides and control KLH alone were injected i.p. 36 d after the first injection. A, Percentage mortality of mice administered a booster dose of peptide vaccines, measured at 2 h after the injection. B, The IgG (black bars) and IgE (open bars) Ab response in mice immunized with one dose of MP2–KLH on day 0, n = 10. Serum was obtained by tail bleed on days 14, 36, and 56 postimmunization. The reactivity of no-sera control is also shown (shaded bars). The median serum dilution (1:X ± interquartile range) performed was 500 ± 575 for IgG and 64 ± 227 for IgE. KLH-treated mice did not show any increase in serum IgG or IgE concentrations (data not shown). The graph shows a significant increase in serum Ig levels. C, The whole-blood histamine levels in mice immunized with MP2–KLH after the injection of a second dose of the peptide. Error bars represent the SEM. The graph shows a significantly higher whole-blood histamine concentration in mice that received two doses of peptide MP2–KLH compared with that in mice that received the immunization solution minus the Ag (n = 2–5). *p < 0.05. To investigate the nature of the anaphylaxis, naive mice were given one dose of MP2–KLH, and serum was collected 14, 36, and 56 d postimmunization. Analysis of these sera (by ELISA coating with MP2–BSA) showed that immunization with MP2–KLH caused a significant increase in anti-MP2 serum IgE after 36 d (p < 0.05) (Fig. 1B). Anti-MP2 serum IgG concentration increased 10-fold (in OD) over the same time frame. Directly after the administration of the second dose of MP2–KLH, the whole-blood histamine levels rose significantly (p < 0.05) compared with those of the control group (Fig. 1C). The highest histamine concentration recorded peaked at 11600 nmol/l 30 min after challenge compared with 3600 nmol/l in mice that received the control immunization. Those mice that survived displayed a significantly raised (p < 0.05) histamine level that persisted for up to 8 h after challenge. To investigate whether the carrier molecule influenced the immunological response to MP2, mice were immunized with unconjugated MP2, followed by a booster dose of unconjugated MP2 by the same schedule as for MP2–KLH. Again, directly after the administration of the second dose of unconjugated peptide, mice experienced severe anaphylaxis and a high mortality rate (Fig. 1A). The serum histamine levels in mice rose to 1106 ± 8 nmol/l compared with the control of KLH alone (204 ± 74 nmol/l), and the body temperature decreased to −5.10 ± 0.60°C compared with −0.2 ± 1.9°C (n = 2). These results indicate that the KLH carrier was not a factor in the development of anaphylaxis. Lymphocytes obtained from mice sensitized with MP2–KLH showed a marked increase in proliferation after secondary exposure to the peptide compared with that of the negative control. Flow cytometric analyses (Fig. 2A) indicated that 5 h after stimulation with the peptide, the rate of cell division was seven times higher (4.4 ± 1.1%) than that of those exposed to control solution (0.61 ± 0.1%). This difference was more pronounced by 24 h and 72 h (Fig. 2B). These results, along with data supporting the development of anaphylaxis from immunization with unconjugated peptide (see earlier), indicate that MP2 is a T cell epitope. The proliferative capacity of CFSE-labeled splenocytes obtained from mice sensitized with MP2–KLH. Cells were exposed to anti-CD3, anti-CD28 and IL-2, MP2–KLH, or control. With each division, the fluorescent intensity diminishes by half as the label is inherited by daughter cells. A, Representative samples from a flow cytometric assay for T cell proliferation after stimulation with allergenic peptide MP2–KLH. Division was apparent at 24 h postlabeling and pronounced by 72 h. B, T cell proliferation over time. Cells exposed to mouse anti-CD3, anti-CD28, and IL-2 showed the largest proportion of highly divided cells after 72 h (closed squares). Cells stimulated with MP2–KLH (closed circles) showed substantially higher levels of proliferation as early as 5 h compared with those of cells that received the control solution of PBS (open circles). The mean percentage (±SEM) of proliferated T cells is shown (n = 2). Sequence alignment analysis of all peptides revealed a high frequency of clustered regions of acidic amino acid residues (ED) that were not found in the nonallergenic peptides (see Fig. 3, Table I). To determine whether anaphylaxis was due to the presence of a high proportion of negatively charged acidic amino acid residues, a further peptide, MP2m, was synthesized. In this peptide, the glutamic acid (E) and aspartic acid (D) residues present in MP2 were replaced by glutamine (Q) and asparagine (N), respectively. This did not affect the binding of mAb Db3G9, which displayed an equal level of binding (p > 0.05) to MP2 and MP2m in ELISA (Fig. 4A). Occurrence frequencies of each residue in the peptides selected with mAb Db3G9 from the pVIII–12-aa library. The frequency of residues from the allergenic peptides (black bars) is overlaid on the nonallergenic (open bars). The vertical axis is the ratio between the observed frequency of each residue in the peptides and the theoretical frequency of each residue calculated based on the proportion of each codon present in the randomly generated oligonucleotides used to construct the libraries, each coding for a particular amino acid. A ratio above 1.0 indicates overrepresentation of a particular residue in the peptides. Cysteine has been excluded as it is not a randomly generated residue. A, The human mAb Db3G9 (black bars) binds to peptide conjugates of both MP2 and MP2m equally (n = 2). The reactivity of no-sera control is also shown (shaded bars). B, The total IgG Abs induced by immunization with peptides MP2 (open bars) or MP2m (black bars) bind to both peptides but, notably, more anti-MP2 Abs bind to MP2 than to MP2m (n = 3). The reactivity of no-sera control is also shown (shaded bars). Six groups of five mice (V1–V6) were exposed to different immunization schedules with MP2, MP2m, or serotype 6B pneumococcal polysaccharide (see Table II). 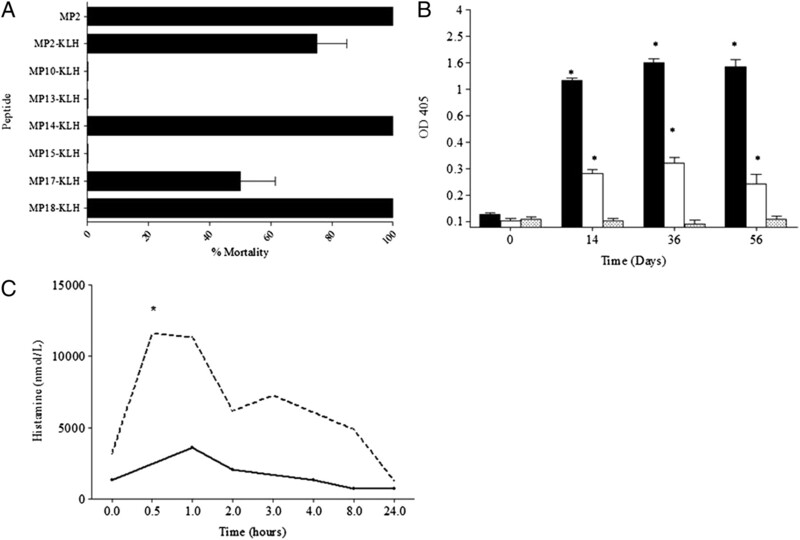 Mice immunized with one dose of MP2m displayed significantly (p < 0.05) lower serum IgE titer (10 ± 0) than that of mice immunized with one dose of MP2 (400 ± 100). Mice immunized with MP2 and later boosted with MP2m (group V2) had greatly reduced morbidity (condition scores, Table II) compared with those of mice boosted with MP2 (group V1) and showed a quicker recovery. To confirm the anaphylaxis, the serum histamine and body temperatures were recorded. Table II shows that those mice that received two doses of MP2 (group V1) developed a significantly higher (p < 0.05) histamine concentration (664 ± 224 nmol/l) and a substantially greater drop in body temperature (−2.8 ± 0.3°C) compared with those of mice immunized with either MP2 or MP2m and boosted with MP2m (groups V2 and V3, respectively) and those of mice immunized with MP2m and boosted with MP2 (group V5). The values for histamine concentration and body temperature mirror each other in their effects, providing confirmatory results. Using ELISA, we compared the ability of the Abs raised from immunization with MP2–KLH and MP2m–KLH to bind MP2–BSA and MP2m–BSA (Fig. 4B). We found that the Abs bound to both peptides but, notably, less anti-MP2 Abs bound to MP2m than to MP2. However, anti-MP2m Abs do cross-react and are shown to bind MP2 and MP2m equally. This indicates that an immunogenic epitope of MP2 was not present in MP2m and that an important proportion of the Ab response to MP2 was generated against this epitope. In this study, we have shown that novel peptide vaccines can induce systemic anaphylaxis in mice. In a mouse model there are two pathways that can lead to systemic anaphylaxis: a classical pathway mediated by IgE, FcεRI, mast cells, histamine, and platelet-activating factor and an alternative pathway mediated by IgG, FcγRIII, macrophages, and platelet-activating factor (12). We have shown that immunization with a peptide conjugate vaccine induced a rapid, fatal anaphylaxis, provoked by the production of peptide-specific IgE and the release of histamine after booster injection. This suggests the response is primarily IgE-mast cell dependent, although we cannot exclude a role also for IgG. Despite all seven peptides being recognized by the mAb Db3G9, only four provoked an allergic reaction in vivo upon booster injection. This indicated that it was not shape but the amino acid sequence that was critical in determining allergenicity. Using a sequence alignment tool, significant similarities between the allergenic peptides (MP2, MP14, MP17, and MP18) were identified (Table I). Similarities included the pairing of tryptophan and proline residues (PW, WP, or WGP), which are highly important to the structure of small peptides, although they also were found in the nonallergenic peptides MP10 and MP13. Proline residues are known to create important structural features such as an l-shaped bend that may serve a role in orienting important residues for Ab presentation (6). Another similarity was the occurrence of glutamic acid (E) and aspartic acid (D) residues found as pairs or in close proximity to each other (i.e., ED, EWD, and DE). This feature was absent from all nonallergenic peptides, including peptide MP13, which otherwise showed a high level of similarity to peptide MP2. This feature has also been reported for other known allergens, with several researchers identifying IgE epitopes that contain a higher proportion of charged amino acids (D, E, and K) compared with IgG epitopes (13, 14). Furthermore, some allergens have been shown to lose their ability to bind IgE when these residues are mutated or removed (14, 15). The sequence of MP2 was chosen for further investigation because this peptide contains only one E and D residue and therefore would be the simplest to manipulate without markedly affecting the three-dimensional structure of the epitope. The removal or substitution of the motifs that contained tryptophan or proline, however, would dramatically alter their conformation, and so removing these could confound the interpretation of the results. A modified MP2 peptide (designated MP2m) was created where the E and D residues were substituted by their uncharged derivatives glutamine (Q) and asparagine (N), respectively, which peptide contains a terminal amide group in place of a carboxylate group. These substitutions were expected to alter the hydrogen bonding potential of the peptide but maintain its overall size. In fact, the human mAb Db3G9 bound to MP2 and MP2m equally, and therefore, its overall shape and the number of peptides per KLH were not affected by this alteration. Despite extensive efforts, the mechanism behind why some proteins provoke an allergic response remains unknown, but it is thought that allergens share particular molecular motifs. The predicted primary structures of some major allergens have indicated that most are relatively small (<70 kDa), negatively charged proteins with low hydrophobicity and high stability. Another feature is the high proportion of negatively charged (aspartic acid, glutamic acid), positively charged (lysine), and polar (serine, threonine, tyrosine, and cysteine) residues (14, 16). Given that Ab Fab regions usually recognize only 8–15 aa, it is likely that the structure of small exposed epitopes and not the whole protein is important in provoking an allergic immune response. Indeed, allergenic epitopes have been shown to be as short as five amino acids (14), and single amino acid substitutions have abolished Ab binding altogether (16). Such substitutions may markedly affect the three-dimensional structure of the epitope and thus reduce Ab reactivity. In addition, Ab binding sites can span several domains, with the amino acids involved being found in different parts of the linear sequence (15, 16). It is therefore difficult to predict exactly which epitopes provoke an allergic response, as eliminating or substituting particular amino acids could alter not only the epitope but also the overall structure of the protein. This study has shown that immunizing mice with MP2m eliminated the allergenic effects seen with peptide MP2. Mice immunized with MP2m displayed significantly reduced serum IgE levels compared with those of mice that received MP2. Furthermore, the raised serum histamine levels and decreased body temperature seen in anaphylaxis were significantly lower in mice immunized with two doses of MP2m. Notably, mice immunized with the allergenic MP2 did not suffer anaphylaxis upon receiving a subsequent dose of MP2m. Similarly, a primary dose of MP2m did not result in anaphylaxis upon boost with MP2. This suggested that the IgE-stimulating Abs produced in response to immunization with MP2 were raised to the region of the peptide containing the acidic amino acids. This effect is also commented on by another group who suggested that the mast cell activation and skin reaction-inducing capacity of three peptide cancer vaccines was correlated to their basic (electric) charge (17). The mechanism behind these events is still unclear, but in our study, the elimination of anaphylaxis may be explained by the genetic restriction of the MHC class II, which plays an important role in the immune recognition of proteins and the development of Ab responses (18). Limited individual variation means that the peptides that bind MHC class II molecules are defined by anchor residues within the sequence (19). For example, peptides with sequences such as xWPxxxED, WxPxxxED, or xDExxxPWx may be recognized by the same MHC molecule, as the peptides share negatively charged residues located four positions away from a proline residue. Thus, it is not the whole sequence that is important to allergen determination but the positions of key residues (19). In this study, which is strengthened by the use of outbred mice, the substitution of ED may have led to altered binding to a particular MHC class II molecule, which in turn eliminated the allergic response. In addition, as MP2m did not induce anaphylaxis in MP2-immunized mice, it appears that the acidic residues are essential for IgE recognition. It seems unlikely that the response involves the cross-linking of IgE/FcεRI receptors on mast cells by multiple peptides displayed on the carrier KLH molecule because anaphylaxis occurred with MP2 in the absence of KLH. Further work into why peptide MP2 provoked a Th2 response that was not seen with MP2m may help unravel important mechanisms in the induction of an allergic response. In summary, this study has highlighted important new features that determine whether a peptide is allergenic and has shown certain amino acid motifs in a 12-aa sequence to be responsible for an Ab class switch to IgE. To date, there are no published examples of anaphylaxis due to peptide mimics of polysaccharide. The anaphylactic response in our study consisted of the characteristic clinical features described in mice (20) coupled with the detection of a significantly higher concentration of histamine in the serum of mice immunized with MP2 compared with that in the serum of control mice. With the current characterization of allergenic epitopes, this allergic response would not have been predicted. However, there was a robust IgE response after immunization with MP2, and this could be used as a surrogate for allergenic potential. We would therefore recommend that an assay for allergic potential be routine in the development of peptide vaccines, and that skin-prick testing in humans or RAST to detect circulating peptide-specific IgE be undertaken before administration of a second dose of vaccine. As a greater number of peptide Ags become available for use in experimental therapies, it is important to establish the safety of individual peptide mixtures. This knowledge may help prevent the induction of anaphylaxis in humans given peptide-based therapy. We thank Dr. Santhosh Mukundan and Sarah Glenn for technical support. This work was supported by the European Union (Grant Code QLK2-CT-1999-00854) and partly by laboratories partially funded by European Regional Development Fund No. 05567.
. 2000. Modulation of Th2 responses by peptide analogues in a murine model of allergic asthma: amelioration or deterioration of the disease process depends on the Th1 or Th2 skewing characteristics of the therapeutic peptide. J. Immunol. 164: 580–588.
. 1998. Immunologic and therapeutic evaluation of a synthetic peptide vaccine for the treatment of patients with metastatic melanoma. Nat. Med. 4: 321–327.
. 2005. Peptides mimicking Vibrio cholerae O139 capsular polysaccharide elicit protective antibody response. Microbes Infect. 7: 1453–1460.
. 1999. 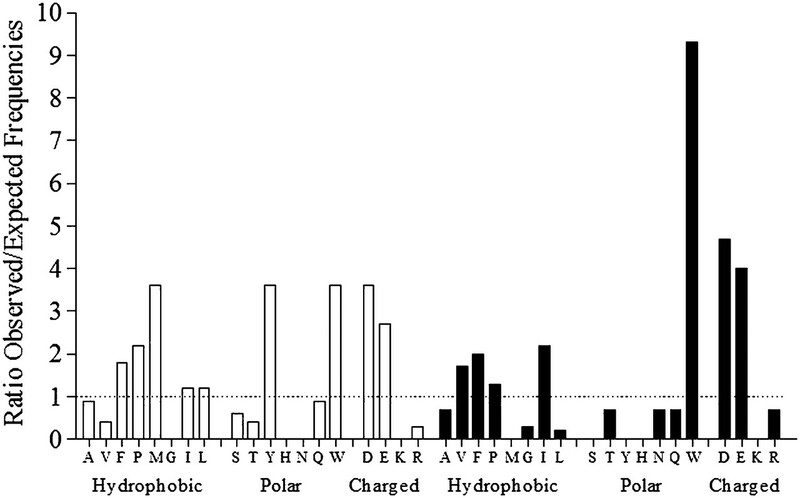 Antigenic properties of peptidic mimics for epitopes of the lipopolysaccharide from Brucella. J. Mol. Biol. 294: 181–191.
. 2001. Selection of phage-displayed peptides recognised by monoclonal antibodies directed against the lipopolysaccharide of Brucella. Int. Rev. Immunol. 20: 181–199.
. 1997. Induction of anti-carbohydrate antibodies by phage library-selected peptide mimics. Eur. J. Immunol. 27: 2620–2625.
. 1995. Peptide mimicry of the meningococcal group C capsular polysaccharide. Proc. Natl. Acad. Sci. USA 92: 4021–4025.
. 2009. Peptide mimics of two pneumococcal capsular polysaccharide serotypes (6B and 9V) protect mice from a lethal challenge with Streptococcus pneumoniae. Eur. J. Immunol. 39: 1527–1535.
. 1985. Guidelines on the recognition of pain, distress and discomfort in experimental animals and an hypothesis for assessment. Vet. Rec. 116: 431–436.
. 1990. New fluorescent dyes for lymphocyte migration studies. Analysis by flow cytometry and fluorescence microscopy. J. Immunol. Methods 133: 87–97.
. 2000. Adhesion of human lung mast cells to bronchial epithelium: evidence for a novel carbohydrate-mediated mechanism. J. Leukoc. Biol. 68: 38–46. 2007. Anaphylaxis: lessons from mouse models. J. Allergy Clin. Immunol. 120: 506–515, quiz 516–517.
. 2006. Lysine as a critical amino acid for IgE binding in Phl p 5b C terminus. Int. Arch. Allergy Immunol. 140: 285–294.
. 2002. Identification and fine mapping of IgG and IgE epitopes in ovomucoid. Biochem. Biophys. Res. Commun. 292: 1070–1074.
. 2008. Nuclear magnetic resonance structure and IgE epitopes of Blo t 5, a major dust mite allergen. J. Immunol. 181: 2586–2596.
. 1999. The structure of major birch pollen allergens—epitopes, reactivity and cross-reactivity. Allergy 54(Suppl 50): 23–26.
. 2006. Nonmutated self-antigen-derived cancer vaccine peptides elicit an IgE-independent but mast cell-dependent immediate-type skin reaction without systemic anaphylaxis. J. Immunol. 176: 857–863.
. 2009. Animal models of protein allergenicity: potential benefits, pitfalls and challenges. Clin. Exp. Allergy 39: 458–468.
. 1999. Immunobiology, 4th EdGarland, New York.
. 2000. A murine model of peanut anaphylaxis: T- and B-cell responses to a major peanut allergen mimic human responses. J. Allergy Clin. Immunol. 106: 150–158.